Hi everyone! Spring has sprung, and it's time to brush off that last bit of snow on the ground and get out of the house. In case you need a nudge, there's a lot of great events coming up in and around Westchester. The 2017 New York Baby Show will once again be the largest show for new and expectant parents in the country. This family friendly event has top brand vendors, speakers and seminars, giveaways, and lots of learning, support, bonding, and fun as you make your way into parenthood. 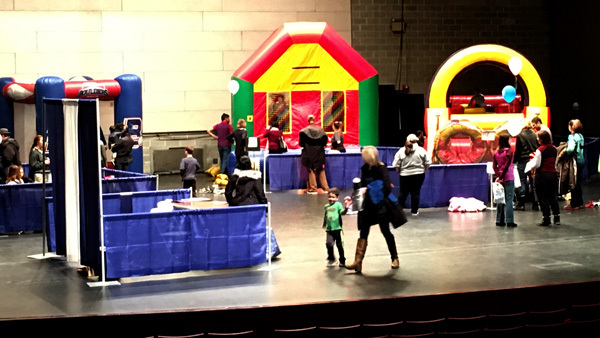 We attended last year and had a great time getting free samples, checking out the latest in baby gear, attending lectures, and some other fun bonuses like a stroller test track and a stroller sterilizing chamber. Want more info? Click here for our review of last year's Baby Show. We are giving away 10 free tickets for you and your family to experience the show! Just be one of the first ten readers to click the link below and enjoy the show on us! Click here for access to free tickets! If the ten free tickets are gone, click the link below for 50% off tickets. Click here for access to half-price tickets! Normal ticket price is $30 per family (for 2 adults and up to 4 children), and $20 per individual, so take advantage of our free and cheap tickets! This is happening this weekend and it's my favorite of the large consignment sales! You get access to baby stuff that's deeply discounted, curated, already tried-and-tested (the stuff that breaks would never make it to a second life), and—what might be the best part—fully assembled! It takes place at the gymnasium at SUNY Purchase. It’s a bit tricky to find, and parking close by can be difficult, but once you’re in, it’s smooth sailing. It's free to attend, you’ll line up outside, and when it’s your turn to enter you’ll be handed an IKEA bag to use as you shop. The aisles can be crowded, so I typically wear my baby when I go to help me zip around faster. There is tons of stuff on sale from strollers to small furniture items to bedding to clothes, books, and gently used toys. Everything is clean, wrapped in plastic when possible, and well-labeled. The prices seemed to be about 30-50% of full retail price. Most items are used but there are some new-in-box finds. There is no haggling, so if you aren’t prepared to pay the price tag, you might want to leave it for someone else. Most of the people working the event are volunteer moms, and they are friendly and helpful. Items are organized in rows by type, and boys’ and girls’ items are mixed together, except for clothes and shoes, which are separated by gender for easy perusal. I’ve never participated as a seller, but from what I’ve read, part of the money from each sale goes to the original consignor, so you’re directly helping other local moms in addition to getting a bargain. All sales are final, so arrive knowing the exact name of the thing you are looking for, or you might end up with a car seat base that doesn’t fit your car seat. I registered for the new moms’ presale event, and I got there right when it opened at 6pm. There was almost no line to get in, and the crowds were reasonable. They had a corralled off area for anything large you picked out, so you don’t have to drag a crib around the gym with you while you shop for other items. The line to check out wasn’t too bad, and checkout was fast and easy, cash or credit was the same price. There are always great finds and the setup is such that it’s fun to shop. The only tricky thing about this location is that it’s a long walk to get from the entrance to the car, so if you plan on buying something large, bring backup to help you take it out of the building and through the parking lot. On the last day of the sale, many items are 50% off. This is more of a recap as the event has already passed, but given it's the 22nd year of the Kids Fair, it's safe to say you'll be seeing again next spring. It's a small, very-local expo that's free for kids and cheap for adults. It's the perfect late winter/early spring event as it's indoors but has a lot of space to run around. There is a small food court at the entrance and vendors with info booths set up on two floors. It sounds big, but it felt small. Even with a 2-year-old zigzagging around the place, we only managed to spent about an hour there. That's not to say it wasn't a good time. The main sponsors had exhibits on the main floor. You could witness the WHUD live broadcast and get your picture taken. I wouldn't cancel plans to come back next year, but if you have a free hour that day and some stir-crazy kids, it's a fun way to spend the afternoon. A hidden gem was the School of Rock music school in Bedford's house band. You haven't lived until you've heard a 14-year-old telling Roxanne she doesn't need to put out at a red light (complete with a Sting accent!). We were smirking until they covered Black by Pearl Jam—and killed it! They're pretty great. That's it for this week! Don't forget to click the links above for your Baby Show tickets. As always, check our website for events and weekly library programs.